The Spoken Tutorial project is the initiative of the “Talk to a Teacher“ project of the National Mission on Education through Information and Communication Technology, launched by MHRD, Govt of India. Spoken Tutorial comes to the aid by making tutorials on Free Open Source Software (FOSS) available in several Regional Indian languages, so that the learner is most comfortable in learning. The tutorials are available at different levels of expertise such as Beginner, Intermediate and Advanced. The reason to initiate Christian College of Engineering and Technology (CCET) as a RESOURCE Center (Robust Extensions for Spoken Tutorial Project on Open Source Software Usage for Recruitment, Community and Education) for Spoken Tutorial is to give exposure and hands on learning of very useful FOSS/IT courses to the students, building their IT competency. Christian College of Engineering and Technology as an RC will help to create buzz, awareness and spread of ST training in a smooth and fast reaching way to the various departments of different Institutes in Bhilai and nearby districts. Spoken Tutorial programs are in line with CCET’s Mission / Vision Objectives, to impact quality Education to the students of Chhattisgarh and nearby areas and to provide them with a platform to make their future by job oriented quality Education. Working with Engineering,Arts, Science , Commerce, colleges from the district to encourage for ST Training Program. Send names of Faculty Representatives from Colleges to ST Team. Spread IT skills training at district level for the colleges and helping them to become IT competent by Offering ST Courses and ST General IT Skills training package in all the colleges. Libre Office : Making documentation, spread sheets, presentation.Tux Typing: To improve wpm speed. Fire fox : for using internet and web. Linux : Free and open source operating system, BOSS Linux : Use in Govt office depts., useful for Chattisgarh state govt. Jobs. Conduct training of mapped courses during lab hours and fill STP at the start of every semester. The Spoken Tutorial Team has mapped the courses of CCET.All departments of CCET will be trained in these courses. 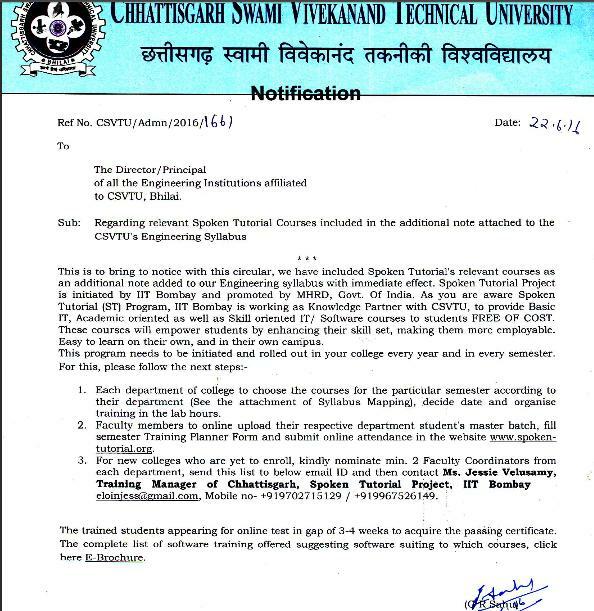 CCET to conduct Awareness Programs by Inviting College departments. (Tech / Non-Tech) within Bhilai and nearby districts. Spoken Tutorial team will provide required ppts, videos, posters, leaflets etc. Free of cost to CCET. 1. Contact and describe the details of Spoken Tutorial Project to institute/ school / govt. organizations and request for a workshop. 2. If they agree, take a acceptance letter from institute/ organization with date and FOSS technology on which they want to conduct workshop. All computers have audio driver so that they can proper listen the tutorial. 4. Take name, email and mobile numbers of two faculty members for workshop, one will be organizer and another will be invigilator. 5. Christian College of Engineering and Technology (Resource Centre) will register them with IIT Bombay spoken tutorial project and provide their credentials for future use. 6. After successful completion of workshop, take examination date which will be after 10-15 days from workshop. 8. After registration of students they will appear in examination. 9. After examination students will get the certificates in soft copy.